Shiang: Empire of Salt (2018. 359 pages) is the second novel in the Empire of Salt trilogy. Shiang directly follows on from the events in Darien, but this novel works well as a stand-alone story. It is not a requirement to have read Darien, but I suggest that you do as it was an enjoyable book. The novel was written by C. F. Iggulden, who has a significant body of work as a writer of historical stories. The second novel in the series is a strangely sedate affair. The action is split between Hondo and his men, who have been sent, on the king’s orders, to arrest or kill Tellius for the crime of sleeping with his brother’s wife. This is viewed as particularly heinous as his brother was king and the affair drove a rift between the king and queen. Now the young king of Shiang blames his uncle for all the misfortune that has fallen on his house and he will have his revenge. So, one thread follows Hondo and his companions as they head towards Darien. Not far on their heels Gabriel and his stone enhanced companions are also heading toward Darien, partly for conquest, but mostly because the stones held by the noble families calls to them. A chance meeting draws Marias, Taeshin’s slave, into their company and although Taeshin has swapped place with Gabriel, in the land of the dead, Gabriel feels a strange affinity with the girl. In Darien, Tellius pays close attention to Lady Elizabeth Forza who has used her family’s stone to look into the future where she sees a great black tide coming for the city. Against resistance from the noble families, many of who do not like the idea of training and arming the lower classes, or of having to spend their own coin to prepare against an enemy they cannot see. For all the characters all roads lead to Darien and an eventual confrontation. I suggested that the book felt languid as this is a character driven story, so while there are action scenes, they are not the raison d'etre of the story. 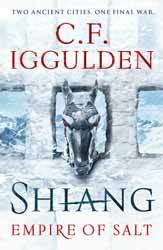 Iggulden introduces us to the new city of Shiang which has a more oriental feel and the city of origin of Tellius. Not that we spend a great deal of time before various factions are on the move towards Darien. Iggulden has chosen to tell a story different to that first seen in Darien. Most of the characters are new to the story. Tellius is the major character which has been brought forward, though his station has improved. Vic Deeds, a major character from the first book, is reduced to a cameo role. Having established the world in the first book, Shiang follows a more pared back, simpler structure and in some ways this makes it the lessor decedent of the first book. The structure of following disparate paths to Darien does mean that the ending is somewhat predictable.